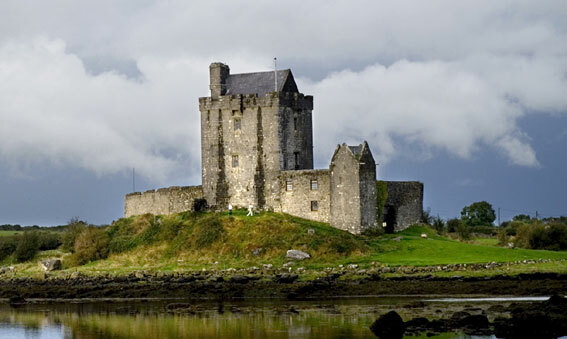 This bike tour in Ireland is especially designed for guests who have 3 weeks at their disposal. 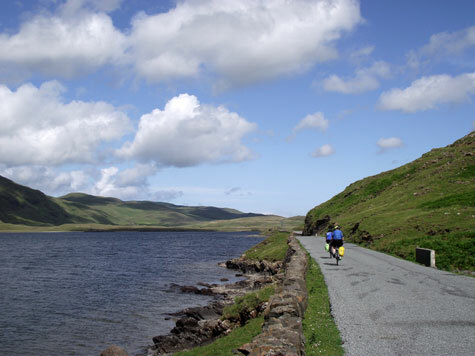 Whilst on this cycling holiday in Ireland you visit the most beautiful spots all the way from Kerry to Mayo. 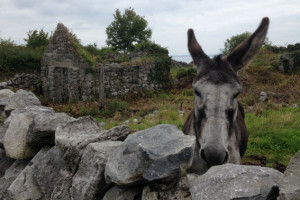 You are starting in the Kingdom of Kerry, cycling parts of the Ring of Kerry. 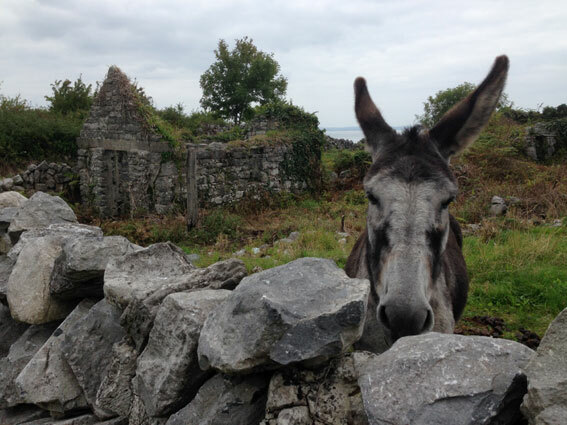 You then venture out to the Dingle Peninsula before heading into the fertile lands of County Limerick. 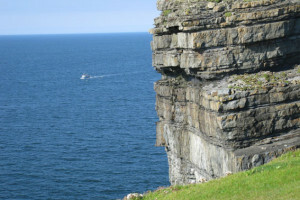 Setting over the Shannon river you arrive in Co Clare where you will find the famous sites of the Cliffs of Moher and the limestone landscape of the Burren. 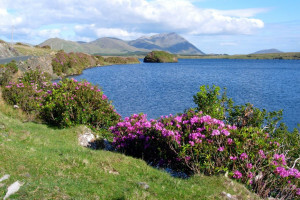 A little bit of island hopping will bring you into the wildly wonderful Connemara region. 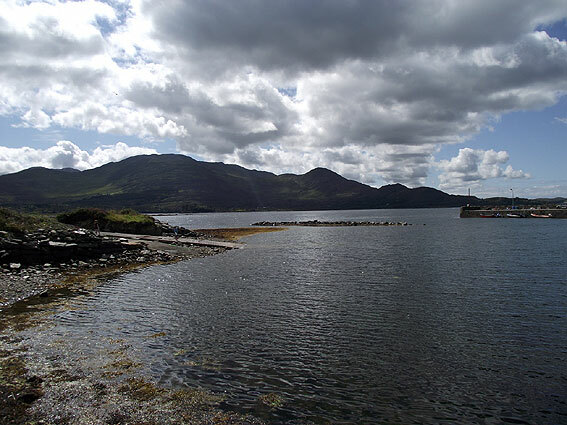 Continuing north still mainly along the coast you come to Ireland’s only fjord of Killary Harbour, before heading into Joyce’s Country and Co Mayo and you finish the trip in Galway, the bustling, historic city in Ireland’s West. 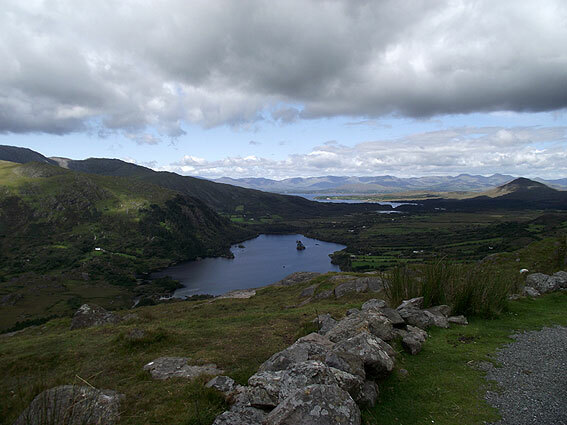 The Ring of Kerry is the most spoken about cycle route in Ireland and beyond. It has gained enormous popularity in Ireland due to the annual Ring of Kerry event in July raising funds for charity, attracting thousands of cyclists to enjoy the scenery and the challenge. But whilst they cycle the “Ring” in one day you are going to bike it over multiple days, leaving you to enjoy a more serene adventure away from the crowds and on quieter roads. 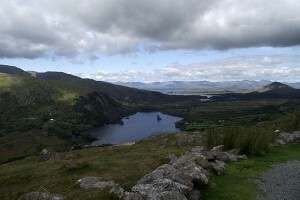 The Ring of Kerry will be followed by a steady move up the phenomenal coast of the Southwest and West of Ireland. 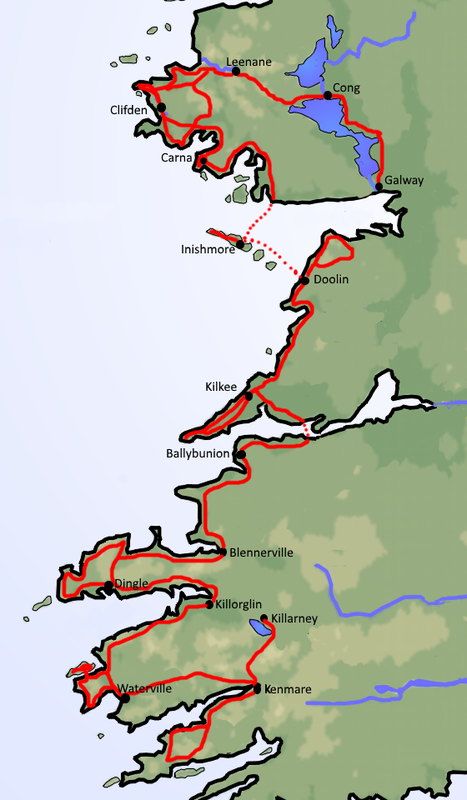 This is truly the ultimate bike tour in Ireland. Arrive in Killarney, free time to explore the town. We will meet you with the bicycles, equipment, and all the information either in the evening or the following morning. 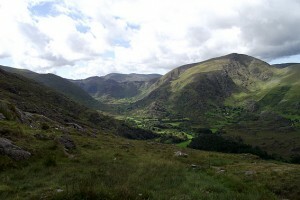 Leave Killarney through the Gap of Dunloe into the Black Valley and on a beautiful back road you climb up to Moll’s Gap. 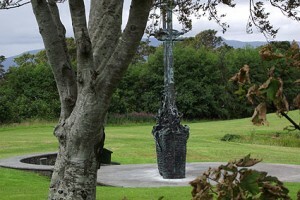 From here the shorter option will bring you down along the busier N road to Kenmare, a heritage town. Here you will stay for two nights. There are fabulous restaurants and music pubs to entertain you in the evening. There is a longer option on backroads. 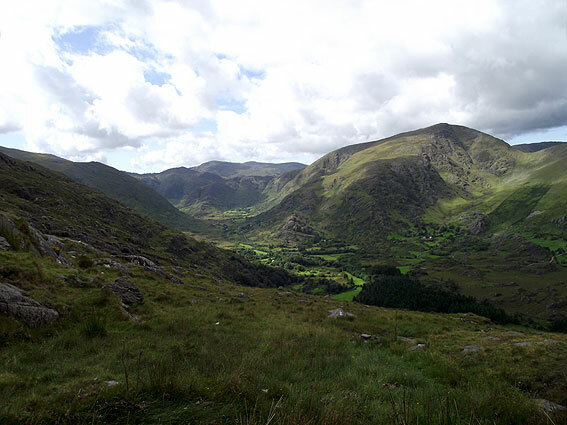 Start the loop with easy cycling to exotic Derreen gardens, for the longer options head to spectacular headlands or cycle over the stunning Healy Pass, one of Ireland’s most spectacular cycles. A beautiful day starting out cycling along the famous Ring of Kerry road until Blackwater from where the route will bring you onto a quiet back-road. Stop in Sneem for lunch before continuing on along the coast. Visit Staigue Fort, one of Ireland’s best preserved prehistoric ring forts. Tour O’Connell’s estate at Derrynane before reaching Waterville for a 2 night stop over. 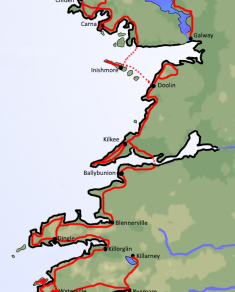 Possibility to visit the UNESCO world heritage site of Skellig Michael (weather dependent and needs to be pre-booked).Alternatively cycle a loop of Ballinskelligs and perhaps Valentia island. Head inland on spectacular and quiet back roads to climb the Ballagisheen pass, from there it is a gradual downhill to the lunch stop in Glencar. You are then cycling along the lakes to the small town of Killorglin, famous for the annual Puck Fair, the oldest fair in Ireland. 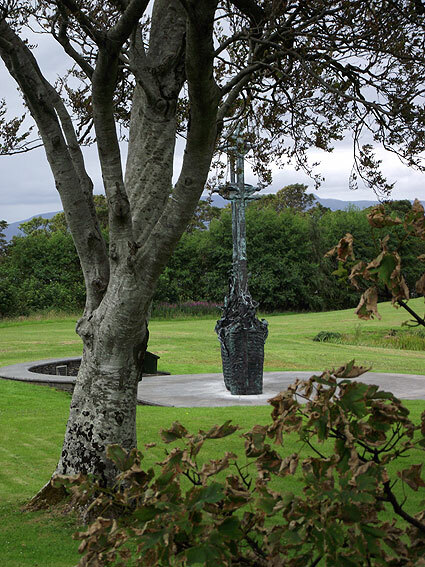 Leave Killorglin on backroads as much as possible, but some busier roads can be expected to the village of Annascaul, home to Tom Crean, who sailed with Shackelton and was part of the team achieving the phenomenal rescue mission to Elephant Island. From here you are on backroads to Minaun Castle before arriving into Dingle Town, beautifully located and a great place to listen to traditional music. 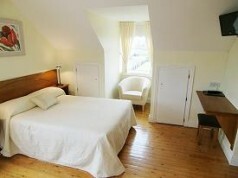 Here you will stay for 2 nights. 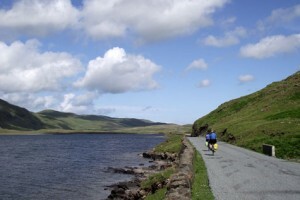 This is one of the most stunning bicycle rides around Slea Head. Visit the Blasket Island visitor centre, as well as Louis Mulcahy’s pottery, and the Gallarus Oratory. A day filled with plenty of interesting sites and stunning scenery. Return to Dingle for a second night. This is a most beautiful day whereby you climb Connors Pass before heading to the village of Castlegregory with it’s beautiful beach. From there it is a stretch on a busier road which cannot be avoided through Camp to the village of Blennerville where you may like to visit the windmill. 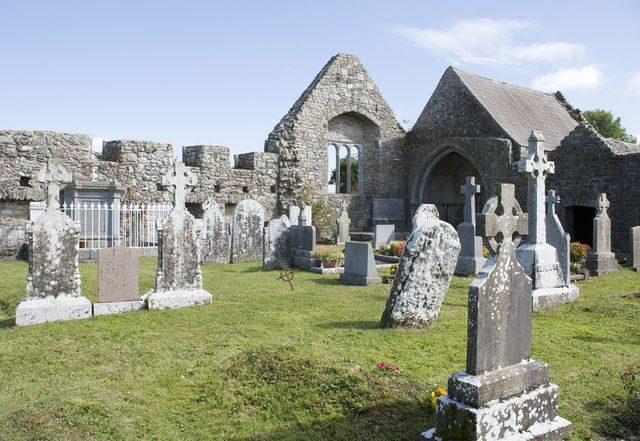 Stay along the coast to the small village of Spa and then to Ardfert with it’s beautiful cathedral ruin dating back to St Brendan the Navigator (6th century). At Banna you will be back on the coast and cycle to Ballybunion. This village is famous for the golf courses which are some of the finest in Ireland and attracted for example Bill Clinton. Keep along the coast and cycle through the green pastures of County Limerick to the ferry port of Tarbert. From there you take the ferry across the Shannon to Killimer in County Clare. The Shannon estuary is home to Dolphins and if you are lucky they will follow the boat. Take to the backroads to bring you to the small seaside town of Kilkee. In Victorian times this was a favourite holiday destination due to the secure beautiful horse-shoe beach. Stay here for the next two nights. 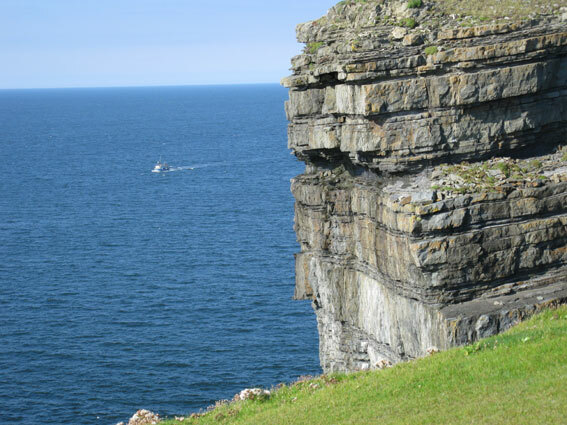 Loop Head is the most westerly peninsula and will offer you some sublime coastal scenery with its cliffs, arches, and freestanding pinacles. 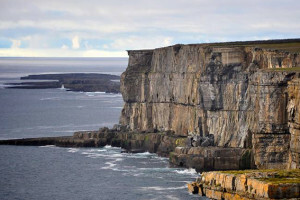 At the tip of Loop Head you will find a fully working lighthouse (open to the public) offering a wide sweeping vista. The cycling is on very quiet backroads. Today’s cycle will remain along the coast to the north passing Lahinch famous for the surfing and golfing, to Doolin (famous for the traditional Irish music). Stay here for the next two nights. 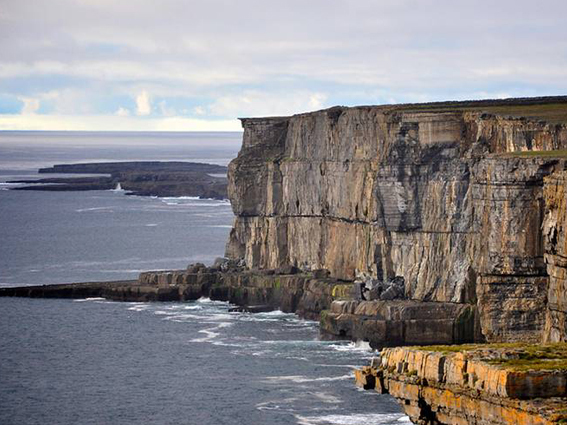 The route lets you cycle past the Cliffs of Moher rising majestically more than 200m out of the sea. This is a stunning ride along the amazing coast passing Black Head, this is the first time that it will become obvious to you why this is such a unique area. 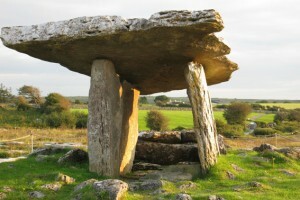 Have lunch in Ballyvaughan before returning via the Poulnabrone Dolmen to Lisdoonvarna and Doolin. There are shorter alternatives available. Cycle to the pier to take the ferry (ticket not included) to the island of Inishmore (the biggest of the 3 Aran Islands). The island is very rich in historic and pre-historic sites and highlights include the cliff top fort of Dun Angheos, the Seven Churches and the coast road to the west of the port village of Kilronan. The island is famous for the knitwear that bears the Aran name. Spend the night on the island to get a feel for island life. 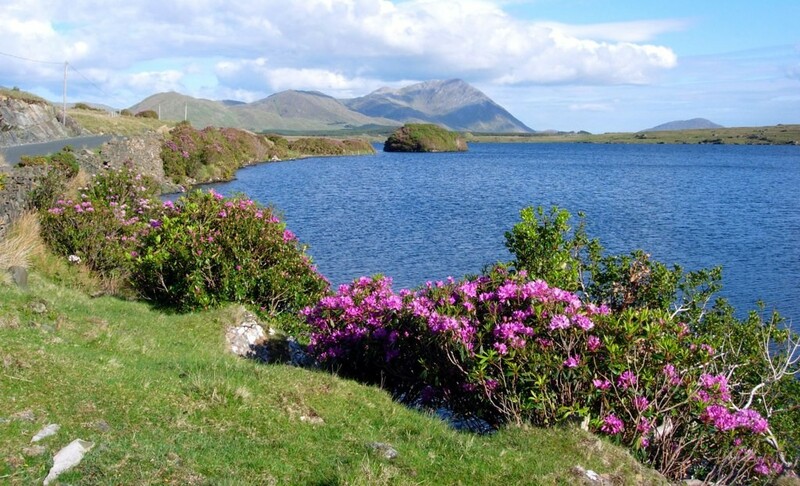 Leave Clifden heading over the magnificent bog road, cycle along the fly-fishing river of Ballynahinch and into the valley of Lough Inagh. 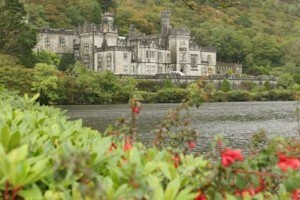 Stop for lunch at Kylemore Abbey, the fairy tale palace of the West. 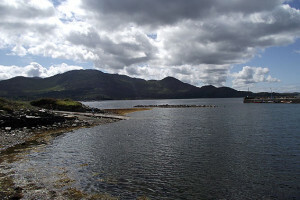 The end point of today’s bicycle trip is Leenane, beautifully located on Killary Harbour, Ireland’s only fjord. The village is famous as location of the film “The Field” starring Richard Harris. 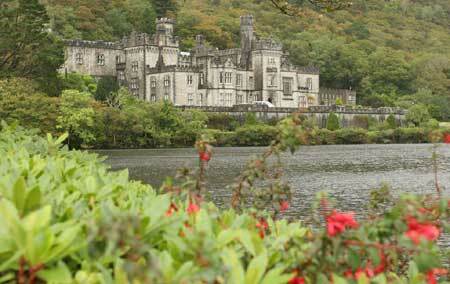 The shortest option brings you directly to Kylemore Abbey via Letterfrack village. You turn inland into the beautiful Maam Valley and then through Joyce’s Country. These are beautiful back-roads bringing you to the small village of Finny and then along the lake of Lough Corrib to the quaint village of Cong. The village has a number of interesting sites, Cong Abbey, the dry canal, the monk’s fishing house and last but not least Ashford Castle (which is now a 5* hotel voted in Conde Nast as one of the Best Hotels in the World). The grounds are stately, as is the hotel which was once the home of the Guinness family. A last day in the bicycle saddle and it is a pleasant cycle through beautiful pastoral landscapes, take a small detour to Ross Errilly Friary, among the best-preserved medieval monastic sites in Ireland, and because if it’s away from the crowd location a beautiful quiet spot to spend time to explore site. The last night will be in Galway, the crown jewel in Ireland’s West. This university town has everything on offer from fantastic restaurants, great music pubs, theatre, street artists, a medieval pedestrianised city centre, to a most beautiful sea-front walk called “The Prom”. Spend your last night here – perhaps you want to add another night to explore the many attractions. 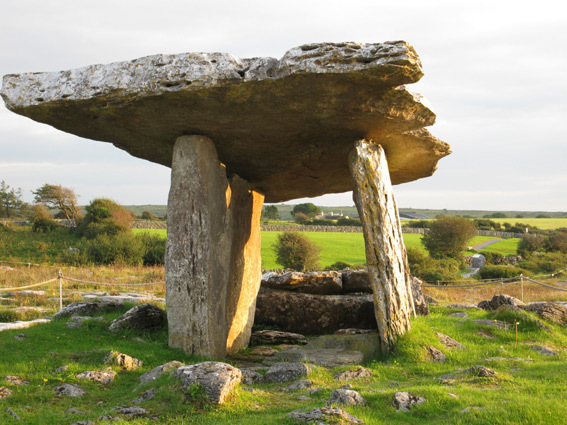 Breakfast, followed by farewell and departure for your onward journey – there are regular buses to Galway from where you can catch bus or train to Dublin. This self-guided bike tour in Ireland is designed to stay in comfortable, friendly, wonderful guesthouses and small hotels. Please find a selection listed underneath. Accommodations can be upgraded if you prefer. 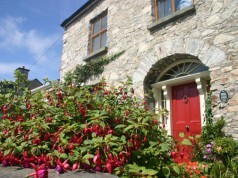 Nolan’s is a long established family run B&B offering guests a friendly welcome and the hospitality for which Ireland is so famous for. Ann was nominated for the Irish welcome Award by Failte Ireland! You will feel at home the minute you arrive! The safe bicycle storage and washing and drying facilities are an added plus for cyclists. This beautiful house is located within a stones throw of the centre of Clifden in Connemara. Enjoy the elegance, unrivaled hospitality and all the benefits of modern conveniences, like orthopaedic matresses, and free wifi. This is one of our favorite houses in Ireland.